Captain America made its first appearance in “Captain America Comics #1” in 1941 printed by Timely Comics. Created by Joe Simon and Jack Kirby, Steve Rogers’s alter ego is known for his distinctive costume that bears the American flag motif, and he is armed with a nearly indestructible shield which can be used for defense and can be thrown as a weapon. Joe Simon conceived the idea for Captain America in 1940 and made a sketch of the character in costume. He named him “Super American”. The name changed into Captain America. Released one year before the attack on Pearl Harbor, the first volume sold nearly one million copies. Even though there were some people who opposed to what Captain America stood for, Captain America became Timely Comics’ most popular character during war time. However, the Axis powers-fighting superhero’s popularity waned after the war ended, despite of the ill-fated revival in 1953. During the Silver Age of Comics it was Marvel Comics’ writer-editor Stan Lee who re-introduced Captain America. In 1963, a chapter titled “Captain America” appeared in “the Human Torch” story. The story depicts Johnny Storm, aka the Human Torch from the Fantastic Four, in an exhibition performance with Captain America. He is the legendary World War II superhero who has returned after many years of apparent retirement. However, as it turns out this Captain America is an imposter. At the final panel of this 18 pages story, a caption says this story was a test to see if readers would like Captain America to return. Re-introduced as an M.I.A soldier, Captain America was retrieved from an iceberg and awakened by the superhero team “The Avengers” in “the Avengers #4# in 1964. Since his comeback he often led the team, as well as starred in his own series. Captain America was the first Marvel Comic character adapted into another medium. Captain America appeared in 1944 as movie serial. Since then, the character has been featured in several other films and television series. 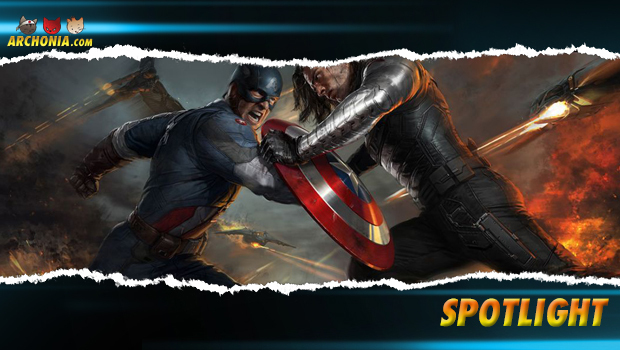 In 2011 Captain America was portrayed by Chris Evans in “Captain America: The First Avenger”, and will soon hit the screens with “Captain America: The Winter Soldier”.